We’re travelling east on the A4 between Chiswick’s Hogarth Roundabout and the Hammersmith flyover. The speedo reads 45mph, the satnav says 40mph, but the stomach insists we’re oscillating somewhere between the two. It feels like this Citroen C1 hatchback is intermittently not firing on all cylinders, the constant throttle position failing to translate to a smooth and sustained speed. But of course we’re not losing a cylinder because we’re travelling by battery, not by internal combustion. If there’s a misfire anywhere it must be among the transistors of this converted ECC Evie electric car. The rocking motion gets worse the faster we go, so it’s fortunate that acceleration runs out at 60mph. We haven’t packed any sea-sickness tablets. It’s a shame that this lumpiness dominates our test drive, because almost everything else about the Evie is smooth and highly polished. It’s easy and very pleasant to pilot around town, being a small car with good visibility, large mirrors, a decent horn, electric power steering and enough low-speed get-up-and-go to nip into gaps. The 30kW (40bhp) motor, fed by 25 lithium ion batteries, hauls the car smoothly from nought to 30mph in about eight seconds with foot flat to the floor. This doesn’t sound quick, but it’s more than fast enough for inner-city cut and thrust. The Evie is ghostly quiet inside and out – the Citroen base car being infinitely better built than the ramshackle EV efforts of Reva or Aixam. The fat-friend weight of the batteries doesn’t spoil the softish suspension, meaning road humps and cracked urban asphalt can be traversed with the minimum of fuss. The driving position is good, helped by the adjustable wheel and marred only by slightly narrow seats and a little lack of left-foot resting room. There’s nothing to keep that foot busy, of course. 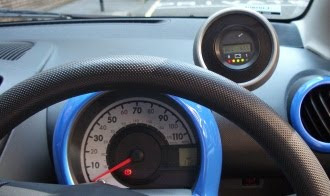 The Evie’s gearbox offers only forward, neutral and reverse, with no clutch and no park position. The handbrake is conventional and, in a probably pointless attempt to avoid wasting power on brake lights, we use it more than we otherwise might when stationary in traffic. The car doesn’t creep from a standstill without throttle, and the regenerative braking succeeds beautifully in feeling like ordinary, predictable engine braking. A circular pod emerging like a giant plastic mushroom from the instrument cowl keeps us in the loop about the battery’s remaining charge, with both a digital percentage display and a row of green, amber and red lights. These LEDs helpfully start to wink in turn as you approach each quarter of capacity. In our test we travel about 13 miles – from Westminster via Knightsbridge to Chiswick and back again, deliberately plying the kind of route this city car is destined to travel. After all, at about £17,000, the Evie is far from cheap to buy. 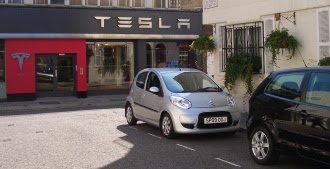 But it does offer low ongoing costs for well-heeled drivers who like to park and travel inside London’s congestion zone, into which EVs can slip without cost. We keep pace with ordinary traffic during our test, which tends to involve using the car’s power to the full for much of the time. Our round trip leaves 61% in reserve, equating to a total range of about 34 miles, well short of the manufacturer’s quoted 60-mile maximum between six-hour charges. No doubt a more feather-footed driving style would extend the range dramatically, but we would definitely want to think twice or even three times before heading off to a destination more than 15 miles away. Overall, we’re disappointed but impressed by the Evie, if that verdict makes sense. It is a better car than we thought from our first brief taste, but is not quite the persuasive package we had hoped for. It is a better bet than the similarly-priced G-Wiz L-ion if only because more of the speed on offer will be usable without fear of disintegration, although the much lighter G-Wiz will probably do better in real-world range. Our test Evie was very kindly supplied by Zipcar, the car-sharing club. Members can drive this exact car for a very reasonable £3.95 per hour. We were duly impressed by Zipcar’s operation, and will look at it in more detail in a follow-up post to come shortly. Zipcar’s Evie, SP09 OOJ, has led a varied life so far. It took a starring role at the Evie launch event in April, standing alongside ECC top brass on the plush carpet inside the Royal Lancaster Hotel, and was photographed on a golf course for a CAR Magazine Giant Test published last month, where it was pitched against the G-Wiz, Mitsubishi i-Miev and Smart ForTwo Ed. It won that round against the opposition. Not having sampled the i-Miev or Ed, we’ll have to take CAR’s word for it.